Choose your adventure at A Wilderness Hideaway. Just a 10 minute drive from concerts and restaurants at Harrah's Cherokee Casino and Event Center. Hike, bike, fish, golf, and zip line through the Great Smoky Mountains. You won't want to leave A Wilderness Hideaway! A Wilderness Hideaway is just minutes from Cherokee, NC and the Sequoyah National Golf Course. This upscale rental cabin has everything you need for the perfect Smoky Mountain Base Camp. An amazing view is the first thing you'll see as soon as you pull up the driveway to this well-appointed cabin. The glow of the gas fireplace will warm your spirit in the living room with soft buttery leather sofas. Granite counters and stainless steel appliances engage any cook in the fully equipped kitchen. The dining table seats four and the breakfast bar has room for two more. 3 Bedrooms & 2.5 Baths: The main floor master suite has a King bed, gas fireplace, mountain view, and Flat Screen TV with DVD player. The private bath has a jetted bath tub. There is a half bath on the main floor just off the kitchen. The second bedroom is upstairs with a Queen size bed and a mountain view. The third bedroom is also upstairs and has a TV and DVD Player - it has a queen bed. The second bathroom has a tub/shower combination. The loft area upstairs has a futon. We had such a fun time exploring the Great Smoky Mountains as a family! This cabin was a cozy, fun place to come home to at the end of a long day. Kids especially enjoyed the Hot Tub and Fire pit! My family love this place! Million dollar view, definitely going back and recommend! Team members were friendly, willing to answer all of my questions and very knowledgeable. The cabin was just as described and very clean, cozy and comfortable. It was a birthday getaway! The Wilderness Hideaway is an amazing property! The views are amazing and the house was so cute and cozy! I will definitely look for this house again for my next mountain trip! The cabin was very well maintained and very clean. murky though.The team at GSCR were very helpful and efficient! Our first day at the cabin was magnificent. We were in awe over the beauty and the serene feeling. The porch looked so quaint and inviting. The beauty was breath taking. We took a dip in the Hot tub and relaxed for a while. We watched movies and enjoyed some hot chocolate. At night, the children played board games and the teenagers sulked because we took away their cell phones. We spent the last night roasting marshmallows. We had a blast. We will hopefully be able to return. It was a fabulous stay with a fabulous view! The master bed slept like a dream with my pregnant back! The cabin has such a homey feel and we would love to come back. Great people to work with. We have stayed with them 5 or 6 times. We loved the front porch with the view of the mountains. We visited Water falls, went driving thru the mountains and to the Casino. The cabin was beautiful and had everything we needed and more as we had so many plans during the day. We came to ride the Tail of the Dragon and one rode in the flat track motorcycle race in Cherokee. Everything was great! Thank you for sharing your home. It is beautiful, peaceful, and relaxing. Just what we needed. Hope to be able to come back! Wonderful long weekend. The home beat expectations and is at the top of our list of homes we have rented in the area. It was a perfect location for us! The Master bedroom was incredible! Very friendly staff. The cabin exceeded our expectations. This was our first time and we are so glad we chose Great Smokys Cabin Rentals. They answered every questions an were very helpful. We loved the views and the cabins was very clean. I have been staying in Bryson City area in these rental cabins for 7 out of the last 8 years. All the cabins I have stayed at were amazing. This year I needed a bigger cabin with the most amazing views and I found it. The cabin was wonderful, clean, large and views were the best yet. The cabin exceeded my expectations, inside and out. Cathie was very helpful in helping me find the perfect cabin. We loved the view, privacy and spaciousness of the cabin. Far exceeded actually. The property quality was fantastic and way more than we were expecting. They are very new properties and incredibly well maintained. Our overall vacation experience was definitely increased as a result of staying in this cabin!We loved The view! The hot tub was enjoyed every day also. Thank you for making available such a beautiful cabin. This was our 7th spring time visit to the Bryson City area and we love it! Wonderful views, food, hiking and family time. Great place with excellent views of the Smokies. The lot is very nice and the cabin has everything you need. Nice to have a full kitchen, satellite TV and DVR. 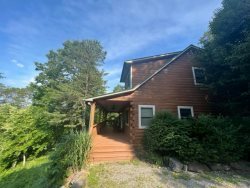 We chose this cabin for its location, views, and the web site pictures and description were great. We're having a great time at this cabin and we are so thankful to be here. We have been waiting for this for such a long time we are really enjoying our stay. Awesome customer service and went the extra mile to help us secure the perfect cabin for our needs! We loved the layout and the 2 gazebos on the wonderful front porch. With an awesome view. one gazebo had an outdoor dining table and the other had a hot tub; great use of the outdoor spaces.